You can use Majestic to check fake news. According to a 2016 survey conducted by Pew Research Centre, 62% of Americans get their news on social media. Social media has allowed the world to find out the latest news across the world as it happens and when it happens but unfortunately, this has been taken advantage of. Fake news has had a significant yet detrimental effect on society, especially within the last year or so. A BuzzFeed report showed that, “In the final three months of the US presidential campaign, the top-performing fake election news stories on Facebook generated more engagement than the top stories from major news outlets such as the New York Times, Washington Post, Huffington Post, NBC News, and others.” Whether it’s regarding an election or even a terror attack, fake news continues to pollute our social media feeds. The problem is a big one but what is the solution? Using BuzzFeed’s “50 Of the Biggest Fake News Hits on Facebook From 2016”, I looked into the Flow Metrics of the articles on the list as well as their respective website. I was actually shocked to see that the article, “Obama Signs Executive Order Banning The Pledge Of Allegiance In Schools Nationwide” had a Trust Flow of 38 and a Citation Flow of 39. I then looked into the Backlinks section of the particular URL and found out that the reason why this article had such high FlowMetrics was because the majority of his top links were of highly reputable sites linking to the article, warning their readers about the dangers of fake news and how to avoid it. After looking at the URL’s of the sites, I then looked towards the FlowMetrics of the root domain. 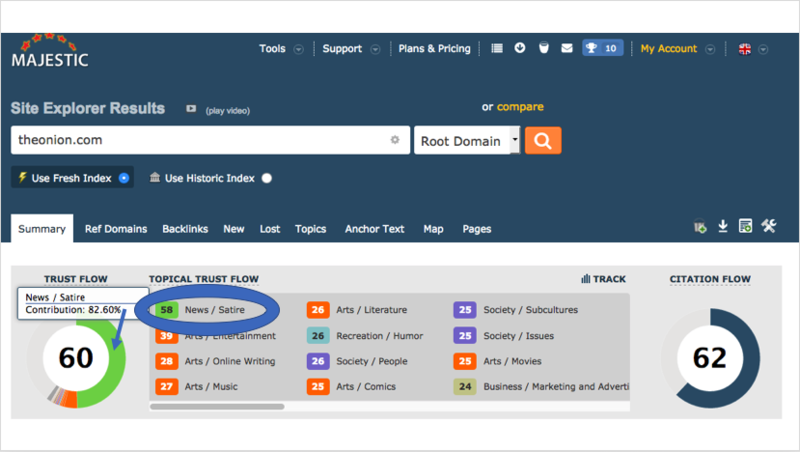 By setting up a campaign for each root domain, it was of no real surprise to see that every website had a fairly low Trust Flow and a higher Citation Flow. Also the majority of sites had a small amount of referring domains and backlinks apart from one site react365.com, a prank website which has over 25,000 backlinks. How do the likes of the BBC, CNN and The New York Times compare? 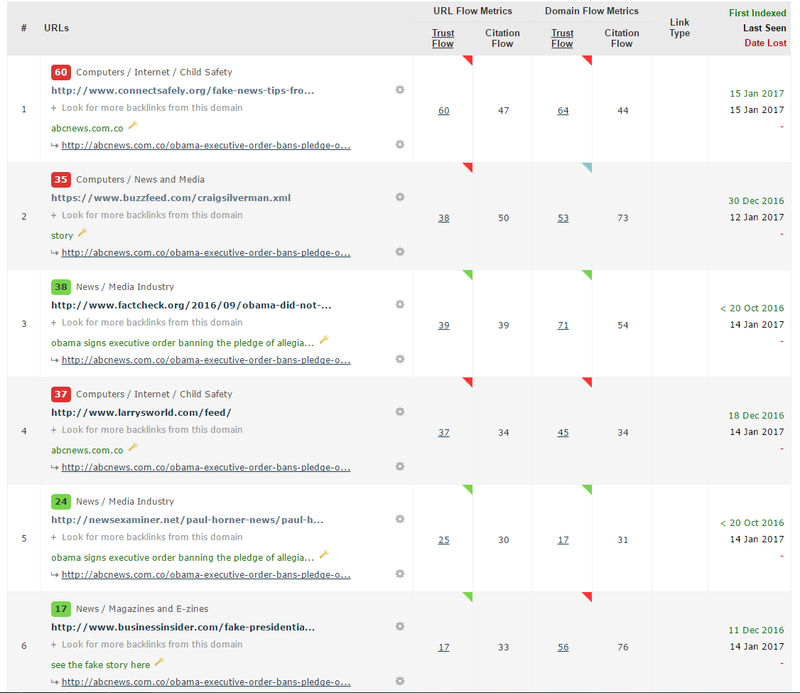 I created another campaign and used the top 20 news sites on Majestic to see whether there would be a massive difference in quality. 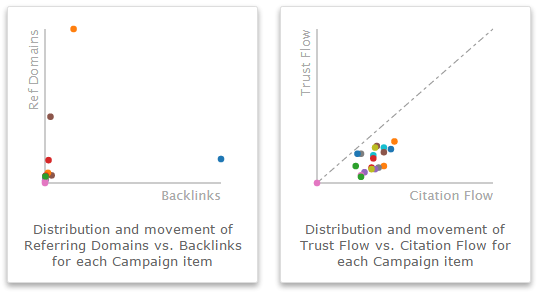 It was clear that there was a huge difference as each website has a Trust Flow of over 80 and the Citation Flow is around about the same level. Also, some websites such as the BBC have over 500 million backlinks and just fewer than 800 million referring domains. It’s evident that there’s a significant and obvious quality gap between the root domains of real new sites and fake news sites. If you’re still not convinced, this is how fake news sites and the real news sites look visually when compared. 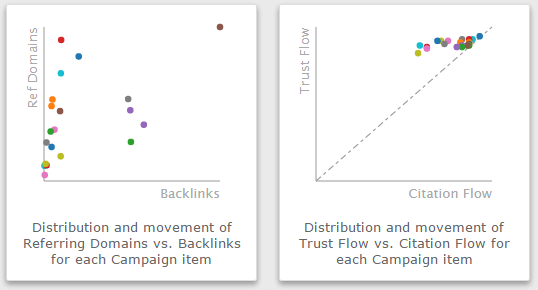 Whilst the links are scattered, the considerable difference in Flow Metrics is clear to see and it shows why Trust Flow and Citation Flow are better metrics to use rather than links when trying to spot fake news. Whilst some news articles are blatantly fake, others disguise themselves pretty well so in order to check out how authentic a news article is instantly, I would recommend to use the Majestic Browser Plug-In, (available on Chrome and Firefox) which shows you the Flow Metrics of the domain you are on. 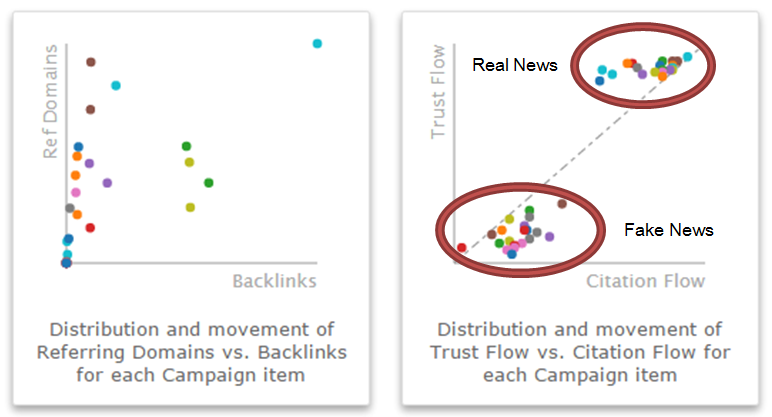 You can also understand fake news by putting these sites into Bulk Backlink Checker and finding out the topical data. Whilst all the real news sites are strong in News categories, the Topical Trust Flow of these fake news sites consist of random categories and that the “News” contribution to their respective Trust Flow is miniscule. Anyone can build a campaign in Majestic and we would recommend that you do so, to be able to visualize and interpret link data over time. Here is an introduction to the campaigns feature on Majestic. Thank you for an interesting idea. I am embarrassed that the small sample size. What sample size would you like? Very nice, now you just need to convince the large social networks like facebook, twitter and the like to use your data, so they can do some ranking on the links distributed on their networks to minimize the effects of fake news and spam. I think this stuff could really be a huge business opportunity for Majestic. We are not a news site. Wrong. People don’t read NYC, Washington Post and such because they hate them. They hate fake news. And you guys are not doing a good job advocating for this kind of message. Stop until it’s time. I am not sure what your point is. It is possible that you are talking to the emotional side of the issue. This is looking at a possible way to develop a process based methodology to assess a level of confidence. The comment uses the word "hate" twice, which is why I would be reticent to delve too far into a nuanced or even reasoned response. Whether people like a news outlet or not is not the same as whether there is confidence as to whether a story may be based on facts or fiction. Of course, a site or page does not have to be popular to be correct, which is I think a valid criticism of this article and methodology. I mean, a quick eyeball of the domain names is easy enough to tell the calibers of websites apart when you’re considering The New York Times vs. My New Herald. What’s getting churned in the blender of tagging ‘fake news’ are the independent outlets that aren’t anywhere near the size of large outlets, but offer insights and more localized views with less corporate pandering (sponsors, not some evil corporate conspiracy). I absoluetly agree. The big site vs small site diagram is great for effect, but correlation is not causation. Fully formed tools and technologies will be required to help machines sort out the wheat from the chaff are only just being considered though and I think Majestic may have an interesting signal to help with that challenge. I agree more or less with your assessments of root Domains, but for Fake News <strong>Articles</strong> this doesn’t work very well. Also, because you haven’t defined what Fake News is. Is this Fake News? Not Fake News according to the Majestic stats. Total BS propaganda according to others. Meaning: you can still have highly trusted domains in terms of statistics (nyt,wapo), but it doesn’t mean they don’t resort to Fake News or blatant propaganda without any convincing journalistic proof. In politics and journalism these days, I would be very careful to claim to have found a recipe to identify Fake News. Like Mark Twain said: lies, damned lies and statistics. Sorry the link got lost – but I would not dispute your observation. It is quite feesible that an article on a well established news site can be complete rubbish. Building out signals to detect fake news will be about probabilities though. A site that gets its own article wrong will be less likely to survive long term and so will develop "usually" processes to reduce fake news. Smaller sites will be less likely to fact check. But (and it is a big but) a small site is not defacto "more likely to be fake"… it is just "less likely to be fact checked AND (bolean And, not "another point And") at the same time be classified as "news". It might be classified as Humour, or Arts or (as this site is) Computers and Operatinf systems. But not news. Fake news is operating in what social scientists would call a "complex system". Like the weather prediction in Britain (another complex system) it is not possible to predict with accuracy, but increasingly weather reports are more accurate as the entire universe of weather is better understood. 50 years ago nobody would have understood that the Jet Stream was so fundamentally important to the seasons. The problem with this article is that it assumes CNN etc. are legitimate sources of news, however if you look into it more (and despite what some people will say this is not ‘fake news’), the US government have a long history of having staff on government agency pay roles being embedded into large media outlets, and domestic propaganda is legal in the United States. does this mean that if a site’s page has high Citation metrics that it can rank higher than a Domain with high Trust metric but low Citation flow ? This is the first real decent research I’ve seen on this topic; the other stuff that came out of academia recently a couple of months ago was less than compelling. Nice work! CNN and NYT and other mainstream outlets publish a lot of misleading news and 1/2 truths. I think that your article shows more how to identify the largest news sites vs smaller news sites as opposed to "real" vs "fake". There are plenty of real news sites that could appear much closer to the lower circle and report more accurately than the top 20 that you mention. The largest news organizations are huge corporations and have agendas and it reflects in their reporting. They are by no means impartial as evidenced by the 2016 U.S. election. Look at how wrong they all were on that and Brexit. I didn’t write the article – so maybe you should have started with "David". Also "I Cant believe I read this" is an interesting name. Anonymous comment loses a little integrity. But that aside: " It’s akin to building a lie detector that says if you have more friends you must be telling the truth, and if you have no friends you are a liar." <<< I love that. Nice line. Also metaphorically correct. That is what links suggest. ~By being able to also weight those links at scale, this also reduces the signal of links generated by automation. Dealing with the issue of fake news will require more than one data point. Majestic may have one of those data points. Dixon, sorry I realized after I posted that you weren’t the writer but rather the person handling the engagement. My apologies for associating you as the writer. I’d want distance from this one too. 🙂 "may have one of those data points" <<< love that.. Nice line, but a little bit different than the opening line of the article which states almost as a fact that majestic can be used to check fake news. While technically correct it can also check recipe pages but can it tell if they taste good? ok let’s assume for a moment that majestic does have a data point. Let’s run a control experiment. Let’s use a control site (I know you remove links so I won’t put one) that is known to be fake, say The Onion, pick a random article that’s at least 3 months old (time for links to accumulate) . Let’s compare that to a page to a site that doesn’t have nearly the national following, say a hometown newspaper in a city with a population under 20k. Pick a news article there that’s 3 months or older. But for certainty of accuracy pick one (written by a local staff writer) that’s pretty benign say one that simply reports a crime beat or arrest, that can be verified by local law enforcement. I’ll bet (sight unseen) that the onions trust and citation flow will show their content to be "real" in comparison. By the way if you don’t want anonymity then don’t allow it. Do you think if someone uses a normal sounding name it adds credibility? Maybe my real name sounds fake too? So does this mean that the mainstream media can just start to link to each others articles to get high Trust Flow and Citation Flow, and voila, it must be "real news" according to you? And everyone should trust you? This is the same mainstream media that is controlled by a handful of people who promote WW3 and who dictate what their journalist can and cannot write. For example "Martin Luther King’s bust removed from Whitehouse" which did the rounds in all mainstream media sites – a fake news piece which has now been removed from those websites. I bet those articles had high Trust Flow and Citation Flow at the time. Is Majestic promoting the leftists mainstream media agenda, that is backed by the neocons and globozionists and the DNC? Or are you actually tackling the fake news that mainstream media pukes out every day? For example the narrative that the Russians somehow hacked the 2016 US elections. Who knows, perhaps the NSA surveillance was down and the staff decide to go to the beach with their CIA buddies while the pesky ruskies were doing their dirty work… And all 17 intelligence agencies, including the Coast Guard Intelligence, the Twenty-Fifth Air Force, the Office of Naval Intelligence, etc totally irrelevant agencies agree that the Russians did it.. LOL. Each one of those articles must have a hell of lot of Trust Flow and Citation Flow.
. I personally find the reporting from these organizations so biased and the editorial oversight so corrupt that to me, within the realm of my own views, CNN and the New York Times are "fake". Then I doubt this method would be to your liking. I think there is a big difference between the "NY Times" and ‘The NewYorker". One is news, the other is a satirical interpretation of the news at best. To say that the NY Times is "fake: though, is not accurate. Some stories within it may be fake, but most are not.